Today is a gaming friend's birthday: DM Nick from the Roll For Initiative Podcast. 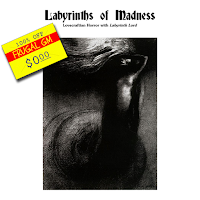 Anyway, I decided to do a little hunting for today's Free GM Resource and I managed to discover Labyrinths of Madness. This is a free PDF download from Lulu, so you'll need to have or establish a Lulu account. Labyrinths of Madness is a short (13 pages, 8 of content) supplement for using the Labyrinth Lords rules to run a CoC-type campaign. Now this is supplement assumes you aren't running your campaign in a medieval-ish setting, but I'm sure you could with only a couple of tweaks.